While the crowded East still offers options, its resources dwindle. Look west to make your fortune. Smart money seeks rich, unclaimed and and hungry new markets. Finance your settlers as they head west to build capitals of tomorrow. Link these cities with rails of steel. Operate your railroad to supply the townsfolk with goods. Go west. Settle the wide, open land. Claim your destiny! Very nice Catan variant, which plays slightly longer but is a lot more interesting with more going on. This game has elements of pick up and deliver, exploration, and also racing to it! The idea is to expand and grow your settlements so that you are able to deliver your supply of goods. The first player to do so wins. Components & Art: Lovely looking board, looks far more engaging than normal Catan and really draws people in. Components are very nice on the whole, although the 'gold' pieces are naff card circles, crying out to be replaced. Also I don't like the rails or trains personally - the trains don't fit onto the rails and the whole thing can look rather messy and cluttered, but that aside the game looks great. Gameplay: More of a thinky one than normal Catan, it feels like a revised and improved version. I like the compensation (if you don't get any resources in the production phase you get a gold at least, which can then be traded/used). I also like the extraordinary build phase, which helps players do more when it isn't their turn, which can prove rather handy. I have played with 3 and 4 players and both games went well, and I dare say it would play reasonably with 2 as well. Overall I really enjoyed playing this game, and I'm not sure I would like to go back to normal Catan, when I know this exists and is in my collection. Our game took about 2.5 hours so set asside some time, although you can doctor gameplay time by removing some of the settlements/goods, perhaps 5 would be a good number to get the game done in around 1.5 hours. 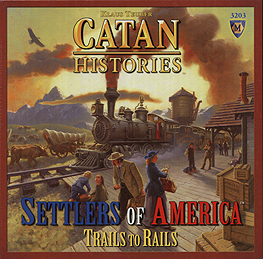 This is another in the Catan series of games, this time with another twist it includes trains and rails. The components, as always, are high quality wooden pieces with some excellent cards and a well made large board. The only let down for me are the money pieces which seem an afterthought and do not match up with the other parts. This is a minor gripe though and not a distraction from the great game. There is a lot going on in this game, which plays a lot longer than most Catans but you hardly notice the time when playing. It has a few changes that help both gameplay balance and removing downtime. The game is played until one player has delivered their last good, goods only being released for transport when you build a city. On your turn you roll dice as normal collecting resources from hex\'s that match that number where you have a city, if anyone does not receive anything they now get a gold. Trading resources is same as normal Catan except you can now buy up to 2 cards for 2 gold each or trade resources to the bank at 3:1, you can even trade 3 resources for a gold. There are development cards, now themed to fit the new game so there are a few neat little bonuses. One addition of note is the extraordinary build phase between turns, this helps balance out people building players into a corner. After each players full turn, every other player gets a chance to build (they cannot trade or move pieces) this can be extremely useful, they can also buy development cards. This latter option means, if you get the timing right, you can buy one just before your actual turn and then use it. To build new cities players first have to build a Settler and move him to a new city site, the settler is then removed and replaced with a city. Each Player starts with one train which can be moved along rails as they are built, players can also build a second train to help then deliver there goods. As the Railways move from East to West some of the resource number tokens get moved depleting the reserves in the East forcing players to settle elsewhere to maintain a steady flow of precious materials. To deliver you goods you must send you train to another players city so this makes for some strategic choices as you have to pay a toll to use another players rail system. I like this game a lot, it plays well and so far every game we have played of it has been pretty close near the end. If you like the Catan series of games then this is a must, even if you are not it is still worth a look as it does address a few shortcomings of the original games.